On October the 23rd 2017 nineteen organisations published a joint letter to Prime Minister Tsipras urging him to end the containment of refugees on the Greek Islands. Well known signatories included Human Rights Watch, Amnesty, and other large refugee and humanitarian INGOs. 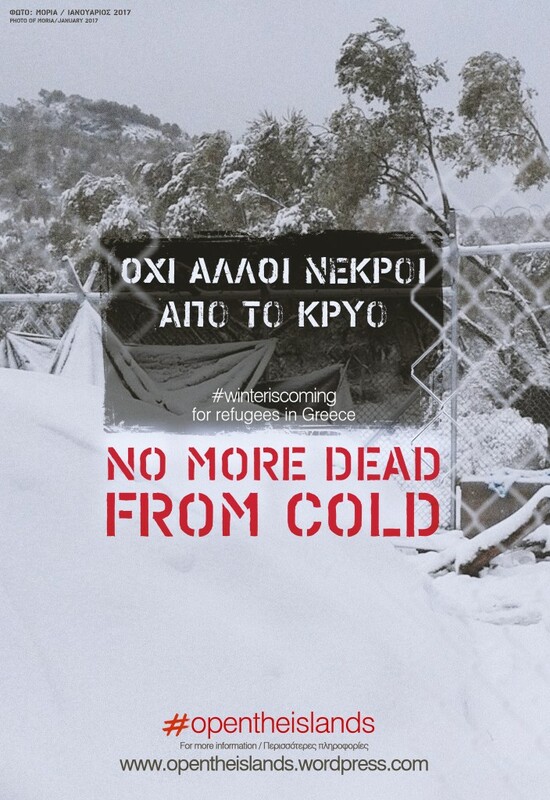 Twelve days earlier however, and a stark reminder of the disconnect between the ‘local’ and ‘international’ in Greece, 40 Solidarity Groups and Organisations (increasing to 121 in the following weeks) had already shared their joint statement: “Open the Islands — no more dead from the cold.” Comprised largely of local, activist and grassroots groups, with only two organisations overlapping, the core message had been the same — permit the movement of refugees from the Islands to mainland Greece. While the grassroots statement had been far more explicit in their condemnation of the EU-Turkey deal, the extent to which the advocacy divide was as a result of decidedly incompatible political approaches, or evidence of networks in action and an organic display of their limitations, is unclear. The founder of one grassroots organisation told me that knowledge about “Open the Islands” was word of mouth (through volunteer discussions) and noted that despite October 23rds statement being directly relevant to the services her organisation provided, they had not been asked to join. The localisation agenda was born out of the World Humanitarian Summit 2016 and manifests itself as the Charter4Change’s 8 commitments and the Grand Bargain. Of which, predominantly, the focus has been on formal partnerships and funding. Signatories, both International Organisations and Government donors commit to increasing funding to local organisations — currently receiving a meager 0.2% cut of the pie globally. It’s a commendable start and confronting the financial disparity in the sector is essential, but examples can be taken from the Greek context to show that the disconnect between the ‘local’ and the ‘international’ pervades far beyond funding structures and mechanisms. And ignoring them as opportunities for the localisation agenda to address, in Greece and elsewhere, will surely only limit the impact and relevance of the funding goals. The discord is evident in parallel advocacy (above), parallel coordinationsystems, parallel approaches and operations. The local, the grassroots in Greece have organised, restructured and redefined to the point where waiting for an invitation from the international community to formalise partnerships and relationships fast became obsolete. They have Campfire Innovation to collaborate and coordinate, they held the Con-Action Conference (the first grassroots conference of its kind), and with 80 partners, grassroots funder Help Refugees is a force to be reckoned with. Squats, cooperatives, volunteerism on and offline, dignified distributions and open camps, define the local in Greece. To the point where humanitarian principles, their guidance and governance often feels inapplicable. Because in local no one goes on mission to field. My particular interest, and that of the initiative, re:viewed, I am working on, is in approaches to accountability. Specifically, the relationships between service provider and service user in the aid sector and the power dynamics that govern them. If I mention the Core Humanitarian Standard’s accountability commitments as a way to frame and justify the concept of re:viewed to organisations that are already cooperatively organised, often by and with refugees, everyone’s thoroughly confused. Jargon need not apply. At the same time, a degree of bureaucratic structure and procedural rigour would be helpful for the local in terms of boosting their ability to sustainably attract, absorb, use more funding. But if you look at reporting and upward accountability mechanisms (The IATI Standard as one example) used by international, their inadequacy for the local context is immediately obvious. Their application simply too much. More ambitious hopes for the localisation agenda would see international seeking opportunities to connect and engage with local. In addition to what can be offered — funding and “capacity building” (or process deconstructing) — what is it that the local has, that is largely devoid in international? Why, for example, would an emotional reunion that played out at the Con-Action conference in Berlin — between a speaker and attendee he had personally helped off of a boat on the shores of the Agean sea and who was now resettled in Berlin — be wholly unimaginable in international? “Localisation” and its twin, “accountability”, are not really bothered about charters, standards, targets and signatures as a measure of their success. Their potential is frankly far greater. They are concerned with relationships, between the international and the local, and between organisations and individuals — and how the power structures in these relationships could be redefined so that efforts to meet people’s humanitarian needs could have greater success all round. In both means and ends. The Greek context is illustrative of the numerous ways and spaces in which the agenda of localisation has the potential to be more meaningfully explored to better meet these needs. Could advocacy be louder and reach a bigger audience, if there was one unified voice and if the platforms and channels were shared? What lessons can the international learn from the local in terms of accountability and relationships with the people they provide services for, how do they organise, operate and include? To what extent could the extension or adaption of the internationals tools and processes be helpful and relevant for local? Envisaging these discussions occupying horizontal spaces requires their conscious and proactive co-creation. A model that the local is already well acquainted with.